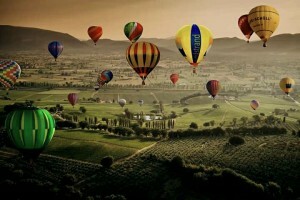 Third Edition of the “Sagrantino Cup” this Summer, with the participation of over one hundred beautifully coloured hot-air balloons, flying into Umbria from all over the world! Every morning at 07:00, balloon teams will take-off from the launch-site and start their 60 to 90 minute flight over the wonderful Umbrian countryside. No entry fee for spectators and photographers so if you are lucky enough to be in the area you should definitely get yourself and your family to Parco dell’Acquarossa to witness the unique spectacle of the inflation of the balloons and to capture some incredible images on camera. If instead, you are part of a team and are thinking of competing, you may want to visit the official website and follow the registration procedure.